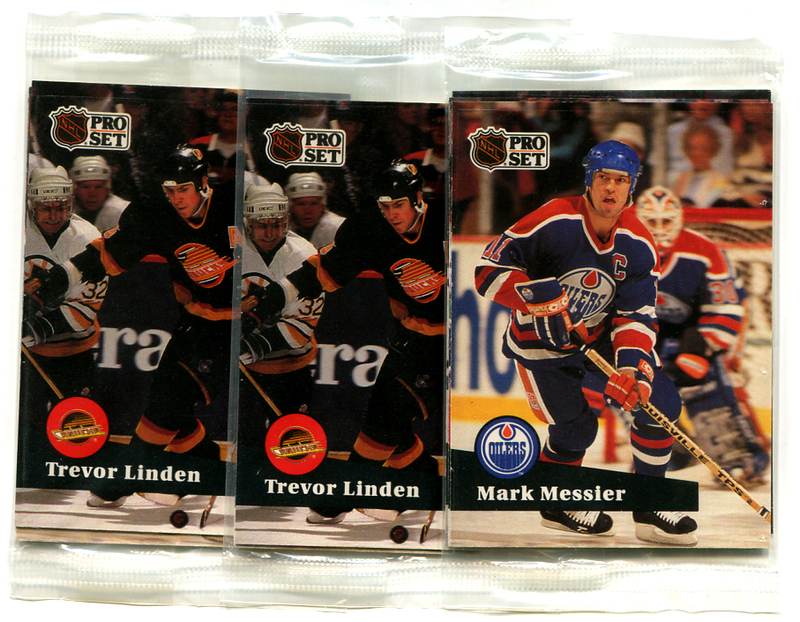 Remember those little 10-cent off coupons that we got in packs of Pro Set Hockey cards during the 1991-92 season? 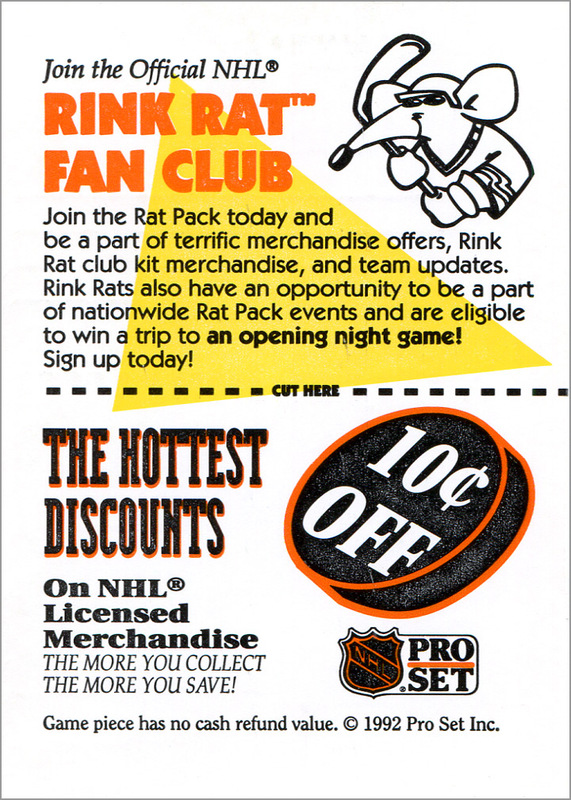 That year, those discount cards advertised the “Rink Rat Fan Club.” Every pack of Pro Set Series One and Series Two had a special offer to “join the Rat Pack” for $3.95. 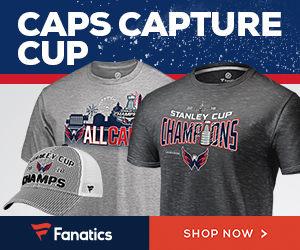 Join the Rat Pack today and be a part of terrific merchandise offers, Rink Rat club kit merchandise, and team updates. Rink Rats also have an opportunity to be a part of nationwide Rink Rat events and are eligible to win a trip to an opening night game! Sign up today! The other side had the sign-up form. 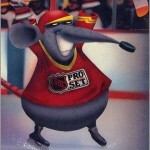 I will admit that back in the day, I had no desire to join the Rink Rat Fan Club. It sounded like something for a little kid, and not at all interesting to a teenage boy — even one like me who collected hockey cards. Not for a second did I consider joining it. Also, a few years prior I had joined the Teenage Mutant Ninja Turtles “Turtle Force Fan Club,” and still remembered how disappointing that was. It took over a year to get my TMNT fan club kit — and all it consisted of was a red bandanna and a cardboard membership card. So, it would not be for another 25 years or so that I would even wonder what “Rat Pack” members got for their $3.95. 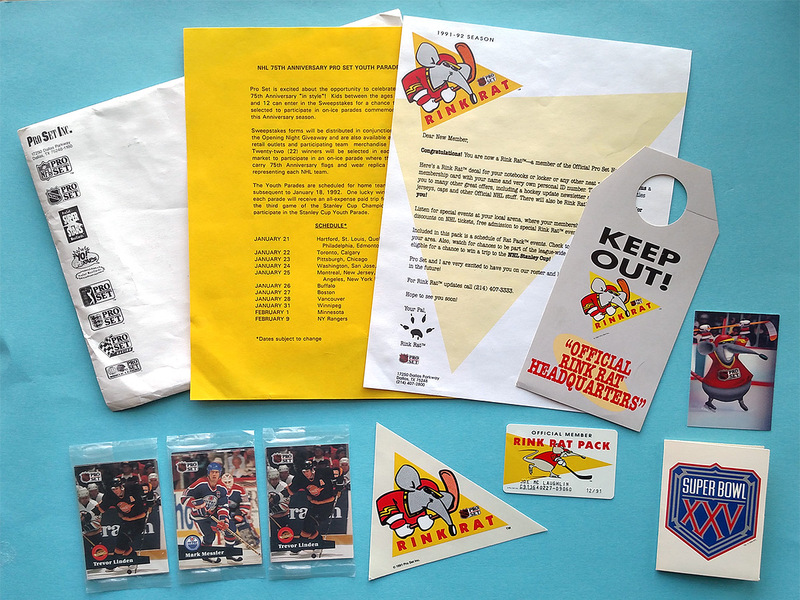 Fortunately, I was able to track down a complete Rink Rat Fan Club kit, which consisted of two separate mailings: one in the fall/winter of 1991 and the other around March of 1992. Note that these items got mixed up a bit between then and now, so I did my best here to put them in the order that fans received them, based on the copyright dates on the items, which version of the Pro Set logo the items use, and the enclosed letters from “Rink Rat.” I did make some assumptions based on that information, but if you know something I don’t, please chime in. Looking at this now, if I knew what $3.95 would have gotten me, I would have joined that Rink Rat Fan Club in a heartbeat. Surprisingly, club members got some pretty nice collectible items for four bucks. A lot came in the initial mailing. 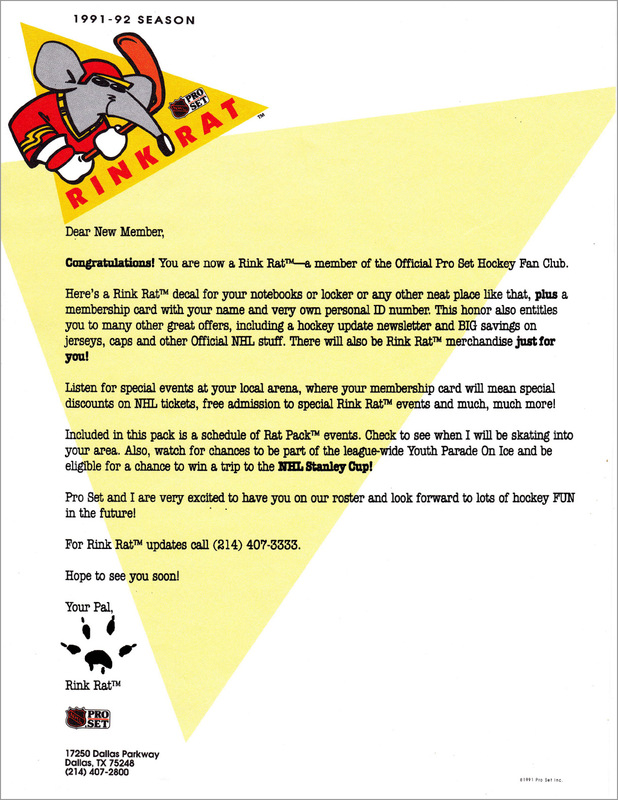 First was a letter from Rink Rat himself — at least I think Rink Rat is a “he” — welcoming you to the Rat Pack. You can click on the letter to see it bigger if you really want to read it, but in essence it explains some of the items in the membership kit, what the perks of the club are (a newsletter and discounts on merchandise) and ends with a phone number that you can call for updates. Man, I really would like to know what people heard when they called that number. 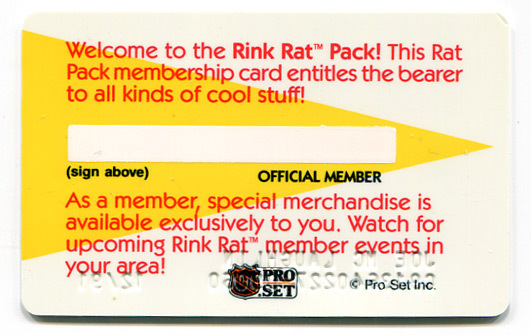 Next up is the one thing that makes me really wish that I had joined the Rink Rat Fan Club — a plastic membership card! 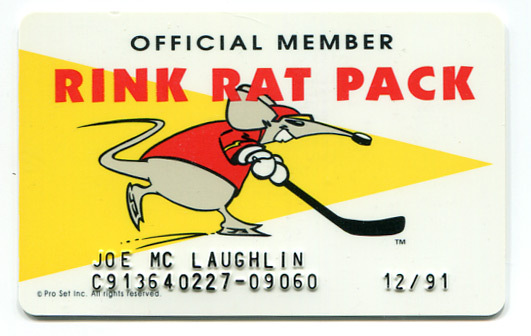 If you joined the Rink Rat Fan Club back in the day and still have your own plastic Rink Rat Pack membership ID card, you have both my envy and respect. Heck, had I known that club members got their own plastic ID card — with their name embossed in raised lettering, like a credit card — I totally would have joined just for this alone. I would have carried it around in my Ghostbusters wallet, too, right behind my school ID and library card. Rink Rat members also got a few other things in their fan club kit, like this large sticker, measuring 6.25″ wide by 4.25″ tall. I haven’t peeled this from the backing (and am not sure if it would still peel, anyway) but it is printed on clear paper. 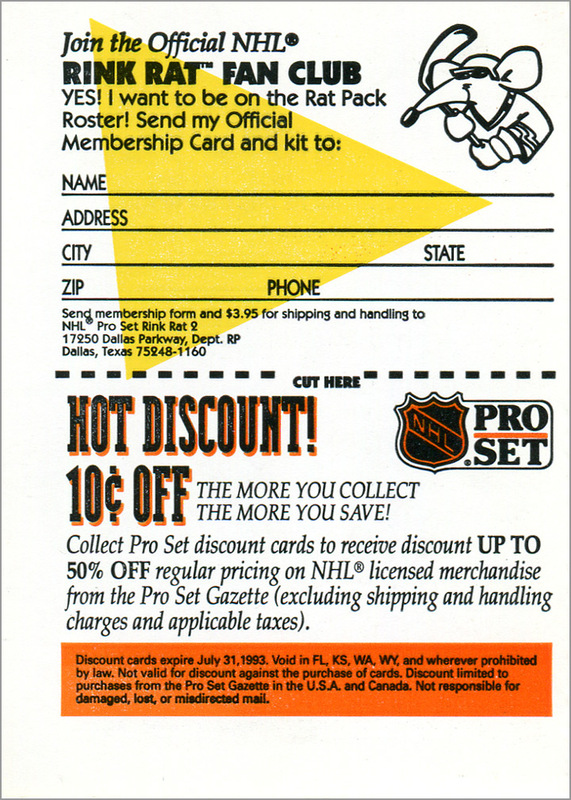 The copyright date on the sticker is 1991, and notice that it uses the Pro Set logo that includes the NHL shield. 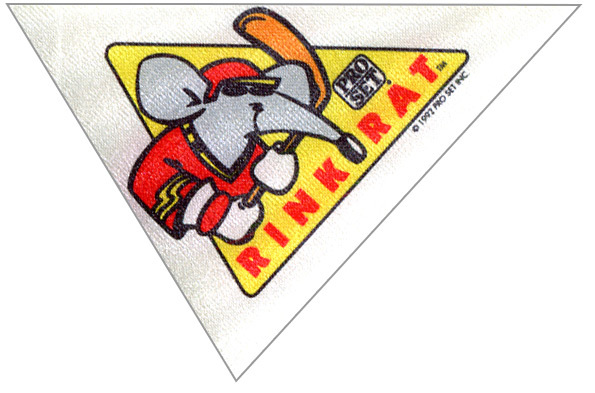 Later Rink Rat items used a different logo. 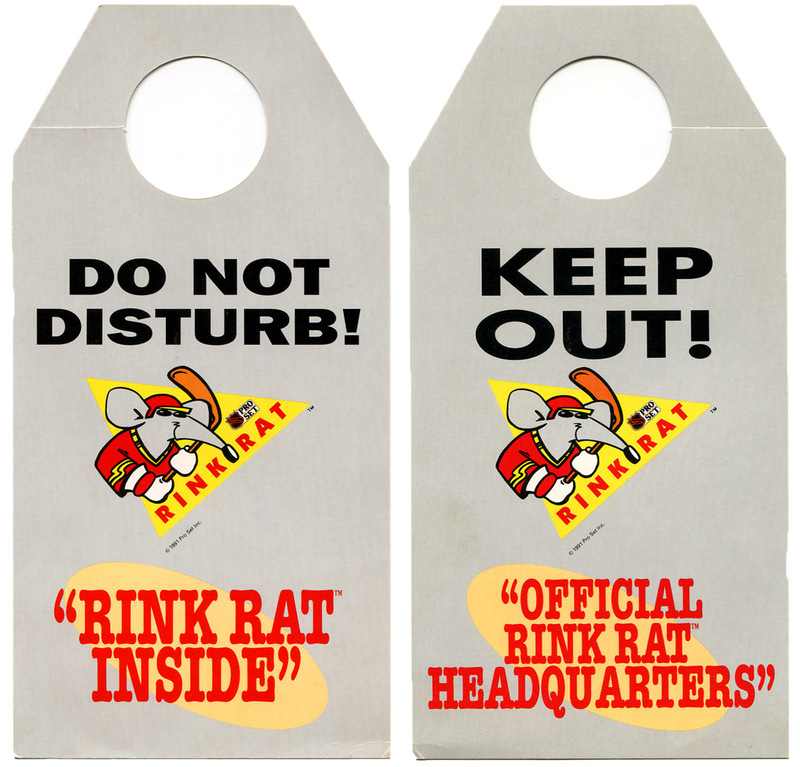 “Do not disturb!” and “Keep out!” It looks like Rink Rats are antisocial creatures. 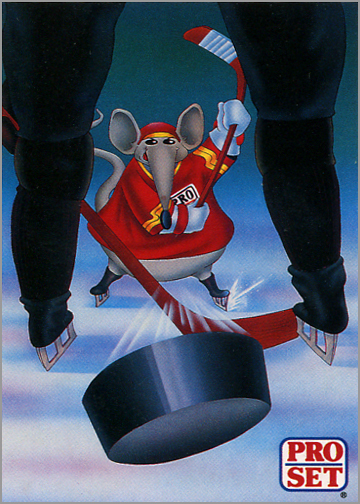 Another awesome reason to join the Rink Rat Fan Club is that it included Rink Rat’s rookie card! Again, had I known that this was included with membership, I totally would have signed up back in 1991. I love goofy stuff like this. 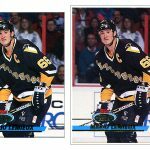 I wrote about this card a while back, which details Rink Rat’s favorite book and favorite player, and urges you to stay in school. The card came in a small cardboard folder with a Pro Set NFL logo on one side and a Super Bowl XXV logo on the other. 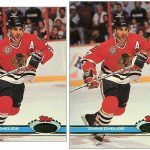 It seems kind of lame that the card wasn’t in a Rink Rat-themed mini-folder, or even a mini-folder with an NHL logo, like the one Pro Set sent out its Brett Hull promo card back in 1990. Also enclosed were three small cellophane packs. Each one has four cards from 1991-92 Pro Set Series One, which is a letdown. These are the same cards that you could normally find in packs, so there is nothing special about them. 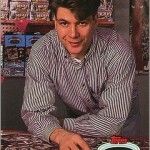 If they were sneak preview cards of a forthcoming set, that would be cool, but 1991-92 Pro Set Series One came out in summer of 1991, so it was old news. Finally, included was a yellow piece of paper with schedules printed on both sides. 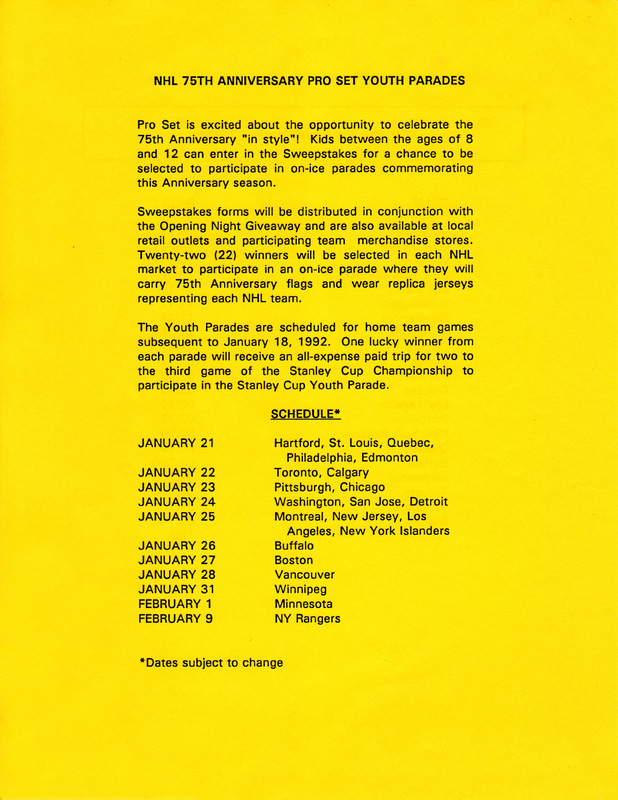 The front explains that kids between the ages of 8 and 12 can win a chance to “participate in on-ice parades commemorating this Anniversary season.” (The 1991-92 season was the NHL’s 75th year.) 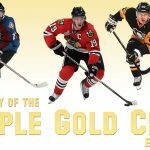 One winner from each local “Pro Set Youth Parade” would get to participate in a parade before game three of the 1992 Stanley Cup Finals. They would also get tickets to that game. 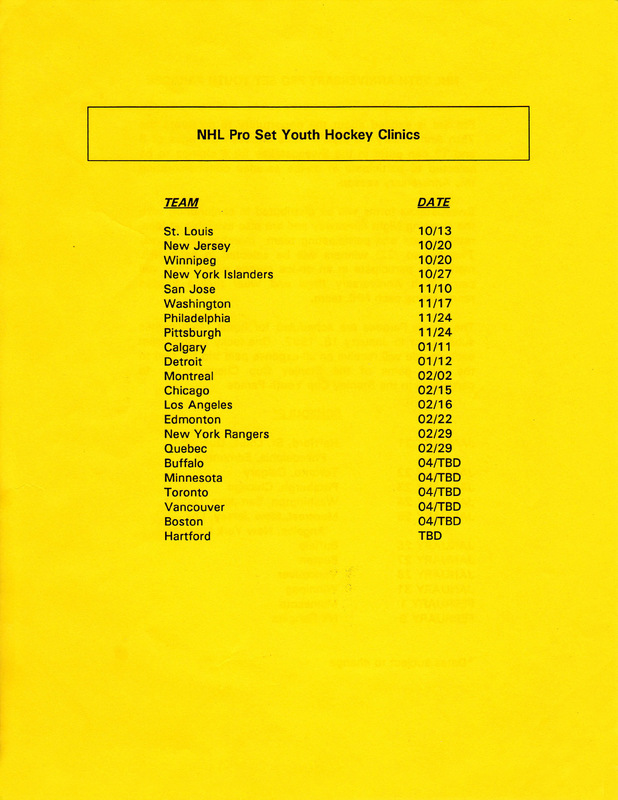 The back lists out “Pro Set Youth Hockey Clinics.” These were hockey skills clinics. It is rather vague on information, and six of the dates are listed as TBD. 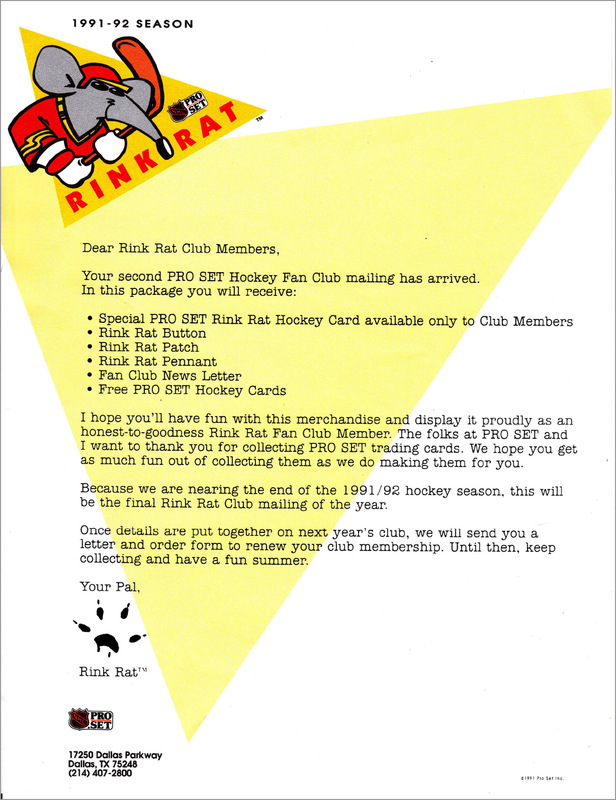 The ID card, sticker and Rink Rat card are worth the price of admission alone, but Rink Rat Fan Club members received even more “cool stuff” a few months later. 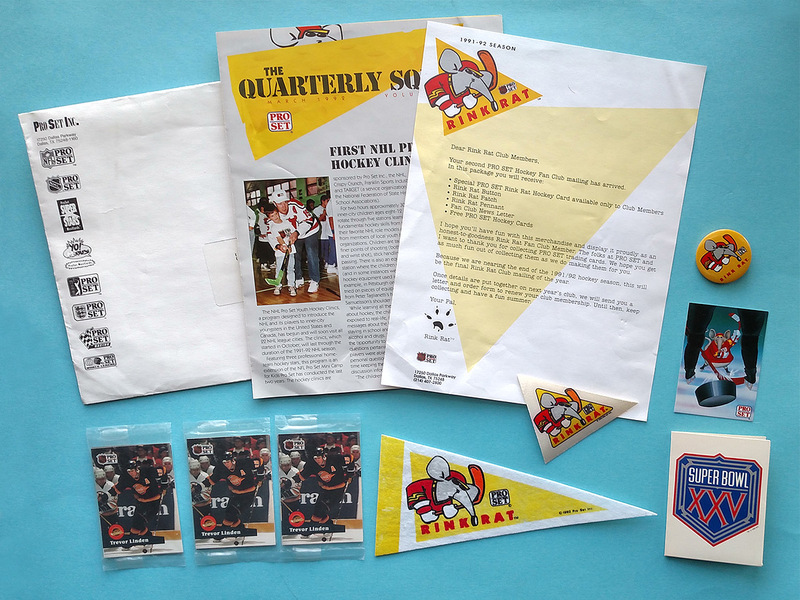 The second and final mailing from the Rink Rat Fan Club included the first issue of The Quarterly Squeak newsletter, more cards and other goodies. Enclosed was the final correspondence from from Rink Rat. You can click on the letter above to see it larger, but basically it gives a rundown of what is included in this mailing, thanks you for being a Pro Set card collector, mentions that this is the final mailing of the season and states that members will get a renewal form in the mail. Perhaps the most significant part of this mailing is the first — and only — issue of The Quarterly Squeak newsletter. 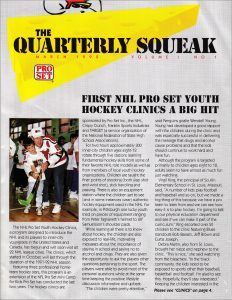 The article on the front page is about the Pro Set Youth Clinics hosted in NHL cities, and even has some quotes from NHL players. The rest of the newsletter is a medley of facts and trivia, an announcement about Pro Set Platinum Series Two (and the Mister Rogers card!) and the “Cheesey Editorial by R. Rat.” You can view a PDF of the four-page newsletter here, but your brain might hurt after reading it. 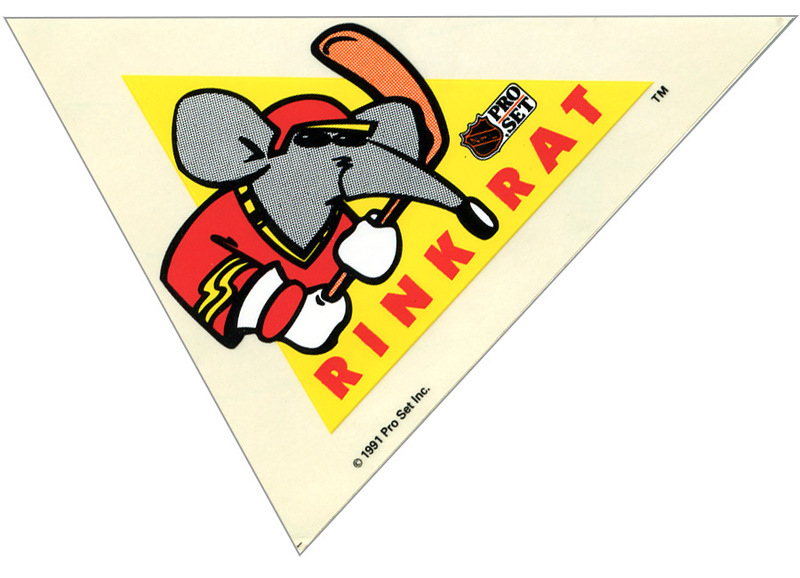 This Rink Rat pennant measures 9″ wide by 4″ tall, is made of felt and has a copyright date of 1992. Notice that it uses the version of the “Pro Set” logo that does not include the NHL shield. 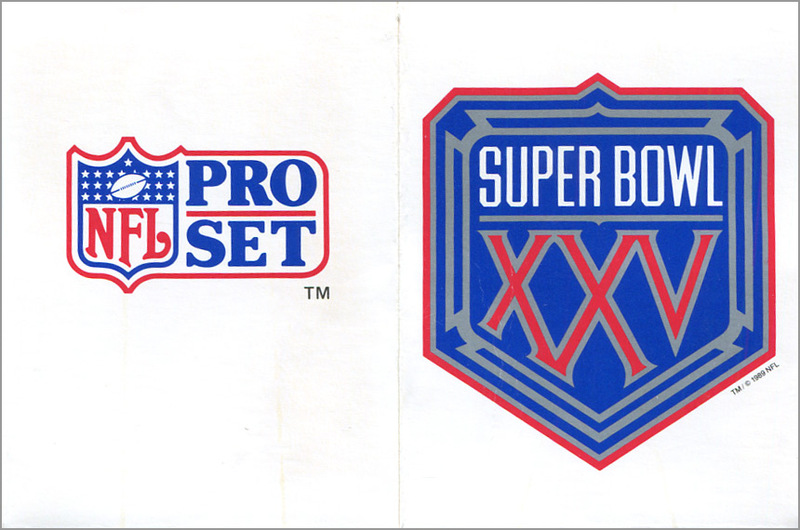 It appears that Pro Set was transitioning to this newer logo that did not depend on the League’s logo. 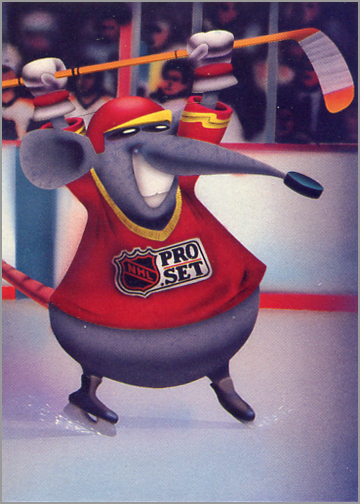 Except for the letter, all of the items in the second Rink Rat mailing use this newer logo. This small, yellow button measures 1.625″ in diameter. Like the patch and the pennant, it uses the newer Pro Set logo and has a copyright date of 1992. A second Rink Rat card! 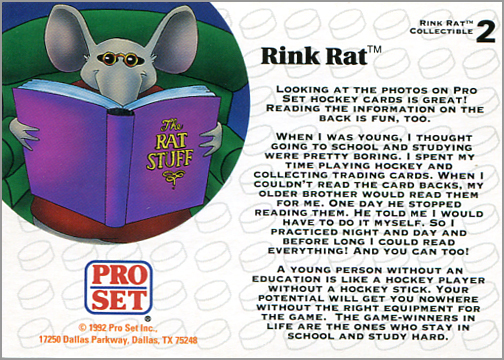 The back of this card explains how Rink Rat used hockey cards to learn how to read. 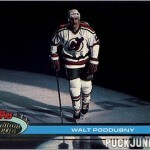 This card came in the same kind of NFL/Super Bowl XXV folder that the first Rink Rat card came in. 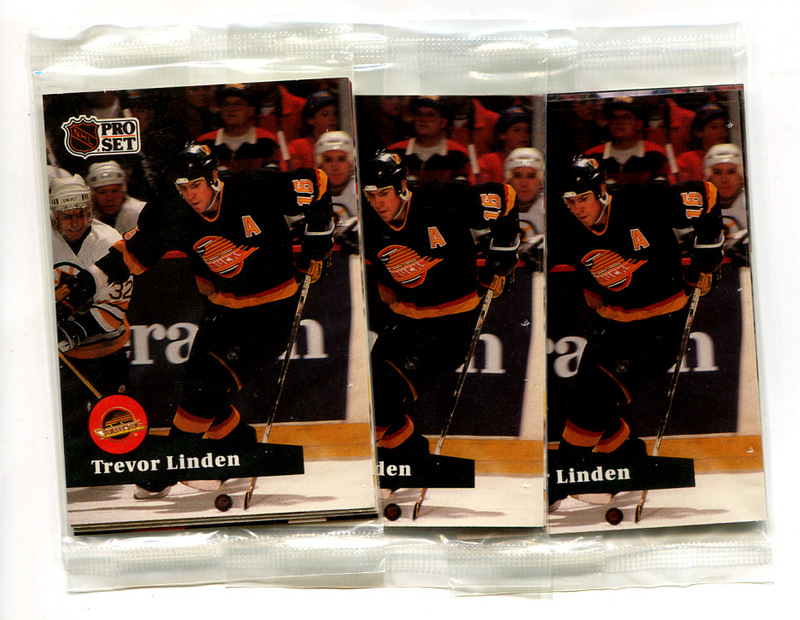 Three more four-card packs of 1991-92 Pro Set Series One cards were enclosed in the second mailing. You would think that, at this point, Pro Set would send some newer cards — either sneak previews of the aforementioned Pro Set Platinum Series Two, or some promo cards, instead of cards that members probably had already. Or at the very least, not knowingly send someone three packs all with the same card on top. And thus ends the Pro Set Rink Rat Fan Club. The Texas-based company was in financial trouble at the end of the 1991-92 season, and did away with all of the frivolities like its mail-order catalog and the Rink Rat Fan Club. After the 1992-93 season, Pro Set closed its doors. Fan Clubs like this are a thing of the past. 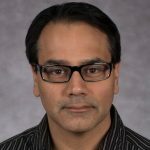 With email, blogs and social media able to inform customers in seconds, there is really no point to sending customers written correspondence or newsletters to inform them about new products and company happenings. Plus, kids don’t collect cards nowadays like they did back in the early 1990s. 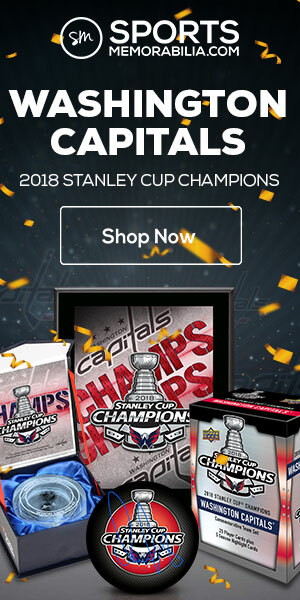 Regularly giving away trinkets, like pennants, buttons, and patches also seems cost-prohibitive, considering how much production costs and licensing fees of sports trading cards have skyrocketed since then. 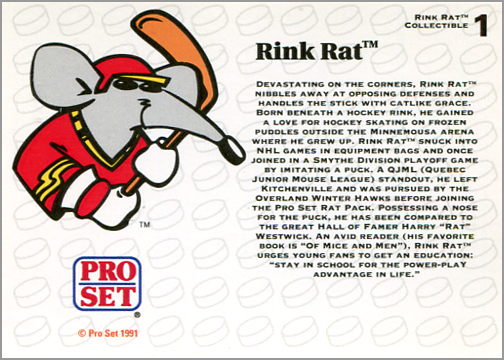 Could the Rink Rat Fan Club been one of the things that made Pro Set a money-losing company? Maybe. It seems that the items that they sent Fan Club members, plus the cost of postage, exceeded the $4 they collected per membership. Then again, maybe all those Youth Clinics, the Pro Set Youth Parades and flying 22 kids and their guardians to a Stanley Cup Finals game were an ever bigger financial drain than the Rink Rat Fan Club. Either way, it is still cool to see how one trading card company tried to reach hockey fans, particularly young ones, during the height of the hockey card boom years. As a member of the Rink Rat crew, I was shocked – SHOCKED! – to learn of the 2nd mailing some years ago. 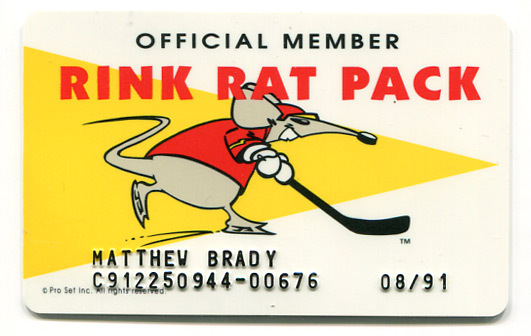 I assumed I had the one and only Rink Rat card, only to discover the existence of a 2nd Rink Rat. I was a loyal Pro Set collector – and this is how you treat me, Dallas?! Thanks for sharing, Mike. Do you still have your membership card? Is my listing of what came in the first mailing consistent with what you received?